In a nutshell, A/B testing allows you to deploy multiple scenarios to your app's users to determine the optimal combinations around app experience, features, usability, etc. This is a great way to test your hypotheses about what your users prefer and helps ensure that you are optimizing for user adoption, retention, monetization and other KPIs that matter for your business. In a 'Hello World' example, think of it as testing whether a button is clicked more when it is red or green. You won't know unless you test it on users! This document is for developers interested in optimizing their app or game. If you want to ensure you're getting the most out of your user experience, flow and monetization - the best way to do that is using real data from your users. A/B testing can help you do that, and this guide can get you started! Which problem does A/B testing solve? Other than optimizing your app, A/B testing can also improve your development cycle if you're using the right tools. 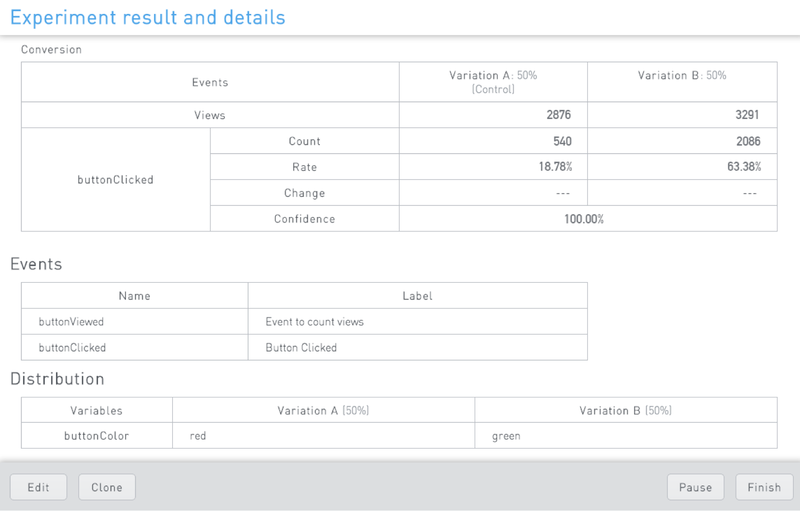 Kii's latest toolset for A/B testing is a great example. 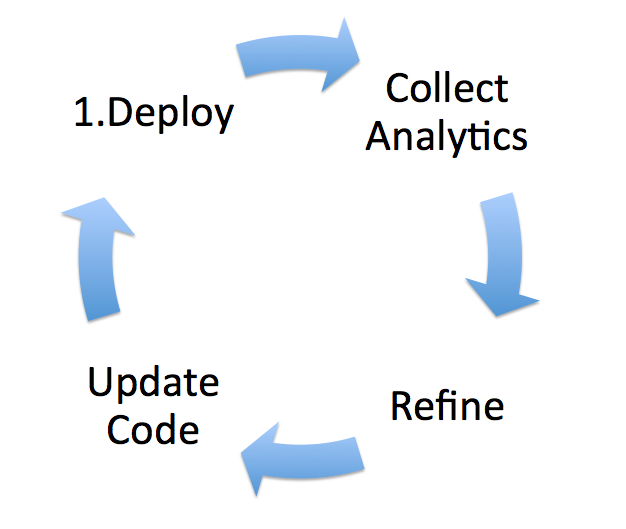 You must deploy your app with version A, wait for it to roll out to a significant number of users, gather analytics, redeploy with version B, wait for it to roll out, gather analytics, then you can finally make your decision on whether version A or B yields the best results. This method takes lots of time on both the development side and simply waiting for the app store and your users to update. With Kii's A/B testing, you can deploy both versions simultaneously, gather analytics and propagate the optimized version to all of your users without ever redeploying. This saves lots of time in the development cycle and gives you more control over what your users are seeing! Is my conversion button better as blue or green? What is the best text for my conversion button? Larger one-time purchase or smaller subscription? In my app's tutorial, is it better to show one big page or several smaller pages? Should the news feed or the messages view be shown as the main tab? How can I integrate it in my app? Kii has just launched an easy-to-use toolset for A/B testing, which can be added to your app in a matter of minutes. For a more in-depth, cross-platform guide, check out our documentation. In this case, we're going to determine if a button is clicked more when the color is red vs. green. To execute the experiments within your app, it will need to download some configuration from the cloud and upload any experiment results that the user generates. Fortunately, Kii's tools allow us to do that very easily. All you need to do is wire up the logic of your experiment! // Get the experiment synchronously. KiiExperiment *exp = [KiiExperiment getExperimentSynchronous:@"EXPERIMENT_ID"
// Assume these are the variables for variation 'A'. // Initialize a variation. This sample code fallbacks to variation 'A'. // Failed to apply a variation. // Execute the getReason() method for the cause of this error. // This sample code fallbacks to variation 'A' if it fails to randomly apply a variation. // Apply the color to the button. // This error occurs when the configuration in the developer portal and the code differ. // In this example, apply variable set of Variation 'A' declared above. // The button is displayed and the "eventViewed" event is triggered. // The button is clicked and the "eventClicked" event is triggered. // This sample code does not consider the user operation context. // In a real app, send it to the handler of the Activity and View classes. // This error occurs when the app storage is not accessible. // This is generally a rare exception and handling it is out of the scope of this sample code. Let's say your experiment has achieved 100% statistical confidence and you are ready to officially deploy variation B to all your users. 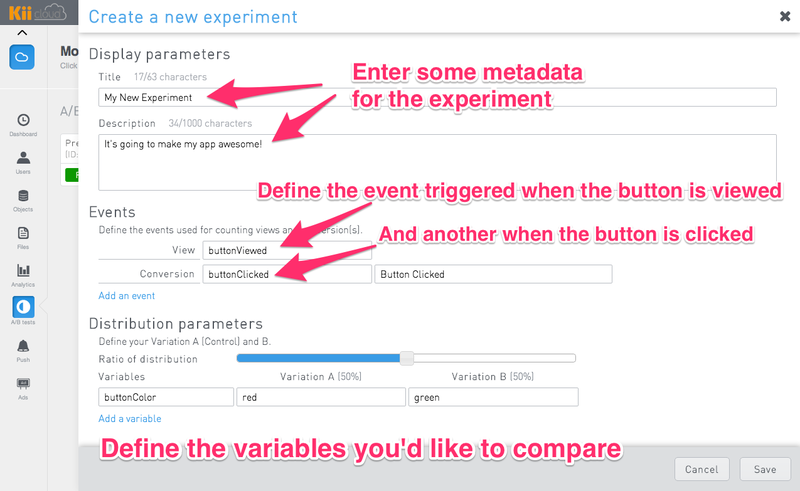 Don't worry about changing code and updating your app - simply hit 'Finish' in your experiment's page. The optimized version will automatically be rolled out to all your users without having to wait for a version update! A/B testing is a must for developers who are trying to optimize their apps and compete in the app store. Rather than spending your time building infrastructure to handle this, a tool like Kii's A/B testing is a great way to add these professional features in your app within minutes. You focus on building a great app, and we'll help take care of the rest! To get started, head over to developer.kii.com and sign up for a free account - no credit card required. If you'd like to download some sample code for iOS with A/B testing working out of the box, check out the sample project on our GitHub page.